Right now, there are millions of Americans with multiple missing teeth, and if this includes you, then you’re likely well aware of the problems they can cause every single day. 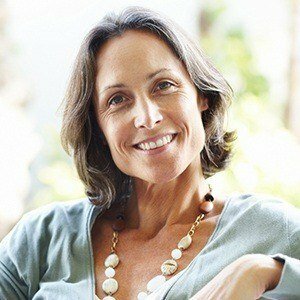 Eating, speaking, and even smiling can feel awkward and uncomfortable, and because your lips and facial muscles no longer have the teeth’s support, they sag, which creates wrinkles. 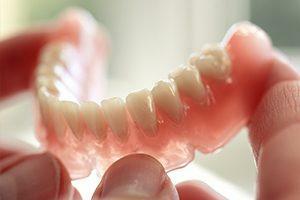 If any of these issues are affecting you, dentures can help them go away. At Aegis Dental, we can provide custom-made dentures that will fill in the gaps and restore your confidence all at the same time. Whether you are missing a few teeth or all of them, we’re able to help, so don’t hesitate to contact us today. Partial Dentures: These are designed to replace numerous missing teeth and fit in seamlessly among any remaining ones (like a piece of a puzzle). They are typically made of ceramic, or acrylic, teeth attached to a gum-colored base, and they are held in place using small metal clasps, or biocompatible thermoplastics, that attach to the neighboring teeth. 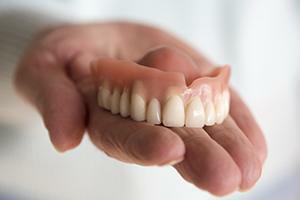 Full Dentures: These can be used to replace an entire row of teeth. They also consist of ceramic, or acrylic, teeth and a gum-colored base, but they are placed directly onto the gums. They are secured using either natural suction or a bit of denture adhesive. Implant-Retained Dentures: While they may look like regular dentures above the gum line, it’s what lies below that makes them truly special. The prosthetic snaps directly onto multiple dental implants placed within the mouth. This makes them much more stable than your typical removable denture, plus they can be trusted to last for much longer as well. Everything will start with an oral exam performed by Dr. Chandy where she’ll look at the current state of your teeth, gums, as well as your jaw alignment. After determining that dentures are indeed the best solution for your tooth loss, she may choose to remove any damaged/decayed teeth before starting to design your prosthetic. Once you have healed from any necessary extractions, she will make a series of mock-up dentures that you’ll try on over the course of a few appointments. These will help you find the look and fit that is right for you. When this is determined, the model will be sent to a dental lab to manufacture your final dentures. During this process, you’ll be fitted for an immediate, or temporary denture to make sure you’re never without your teeth. It may take you a few weeks to become comfortable with your new dentures, and a bit of soreness in your mouth and gums is perfectly normal. Eating and speaking with them may feel awkward initially, but you can speed up the adjustment process by sticking to a soft diet at first and reading out loud while wearing your dentures. After a while, they will begin to feel normal, and you’ll be so glad that you got them. Brush them every day after meals. You should use a soft-bristled brush and a special denture toothpaste to clean them, as regular toothpaste is too abrasive and may cause scratches. Be sure to clean your gums as well so food particles can’t become trapped between them and the dentures. At night, take your dentures out to allow your gums to rest, and place them in either water or a denture cleaning solution. Be sure to attend regular checkups with Aegis Dental so we can monitor the health of your mouth and the condition of your dentures as well. With dentures from Aegis Dental, you’ll be able to enjoy your favorite foods and smile with confidence again. To learn more about our denture solutions and what they can do for you, contact us today.